‘In London, the snow is falling and Christmas is just around the corner – but Allegra Fisher barely has time to notice. She’s pitching for the biggest deal of her career and can’t afford to fail. And when she meets attractive stranger, Sam Kemp, on the plane to the meeting, she can’t afford to lose her focus either. She learned to shut off her emotions long ago and only her sister and best friend Isobel knows why. But when Allegra finds herself up against Sam for the bid, their passion quickly turns sour. Normally any time off work means more time for reading for me. Christmas is the exception; there is just too much to do beforehand and then the TV and Quality Street beckon invitingly and my brain turns to a happy mush for a few days that not even books can penetrate! I have, however, managed to fit in one good Christmas read this year. Christmas in the Snow is about the third Karen Swan book I have read and I continue to enjoy her work. 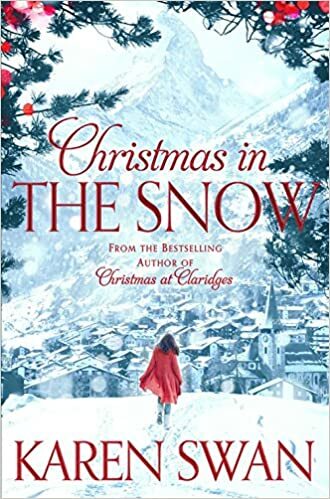 Christmas in the Snow has the standard features of her stories; a central character who is scarred by the past, a very hot love interest with unclear motivations, stunning foreign locations, lifestyles of the incredibly wealthy and a satisfying conclusion. All perfect for a holiday read! It did feel a little long in places and now a couple of days later I feel that more could have been done with the mysterious death that brings the characters to Zematt, but overall I really enjoyed the read and particularly liked the relationship between Allegra and her sister Isobel. Plus the ending really is heartwarming! Oh how I have missed you the last couple of months! I used to get annoyed at bloggers who always moan online about how little time they have had to blog, as if they owed their readers an explanation and now I am here doing the same! The last two months have been crazy busy. We have been decorating two bedrooms, in preparation for guests coming to stay with us at our first Christmas at home! We are also getting ready for baby Browne who is due in January. Pregnancy is going well; we’ve had no big scares or problems. I do feel a lot heavier now and am learning that ‘putting your feet up’ isn’t just a turn of phrase but a necessity! The good news is that I finished work on Friday, the bedrooms are decorated, the Christmas shopping is done and putting my feet up really is top of the agenda! Happily I can still work a laptop and put my feet up at the same time so I hope that I can now return to my lovely blog hobby…that is until baby arrives, and then who knows what life will look like!